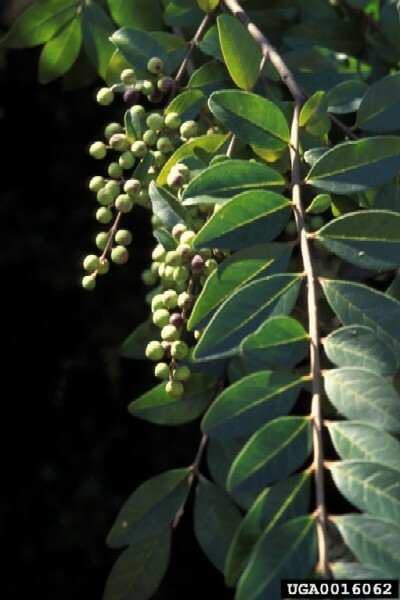 Ligustrum indicum , (Lour.) Merr. Ligustrum sinense, or Chinese privet, is a shrub or small tree native to China, Vietnam and Laos that can grow up to 9 meters tall. Its flowers are small and somewhat unpleasantly fragrant and its fruits are dark blue or bluish-black. L. sinense has been reported in floodplains, wetlands and bogs, as well as in dry, moist and wet forests, waste places, roadsides and open stream systems. It is widespread and common, especially near towns, where it is deliberately planted. It may displace shrubs of alluvial forests and remain persistent in these areas. Chinese privet fruits are consumed by wildlife, particularly birds, which often excrete the seeds unharmed at distant locations where they may germinate and become established. L. sinense can easily escape cultivation to invade adjacent areas and can form dense monospecific thickets. Ligustrum sinense is a deciduous shrub or small tree that typically grows to about 6m but may reach 9m. Its trunks usually occur as multiple stems with many long, leafy branches. Its bark is whitish-tan to gray in color and smooth in texture. Slender twigs are straight, rounded or four-angled below the nodes, and gray-green in color. Leaves are opposite, oval, pubescent on the underside of the midvein, and less than 5cm long. Small, white flowers develop at the end of branches in 5-7.6cm long clusters. Its fruits are oval, fleshy, less than 1.3cm long, ripen to a dark purple to black color, and persist into winter (Invasive.org, 2010; Batcher, 2000 Ulyshen et al, 2009). Ligustrum spp. leaves are high in phenolic compounds that defend against herbivores, especially insects. The compounds work by inhibiting digestive enzymes and proteins (Konno et al. 1998, in Batcher, 2000). 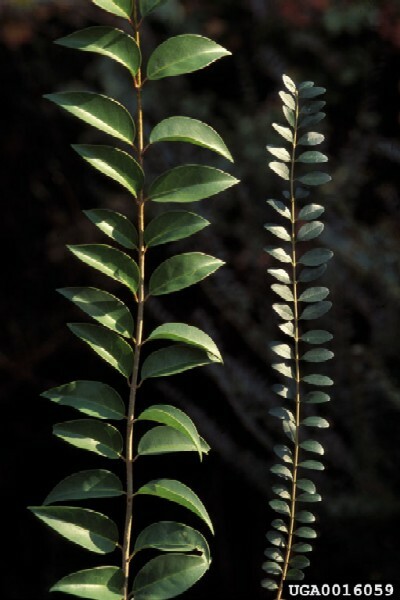 Germination rates for Ligustrum sinense have been variously reported as low as 5 to 27% (Tennessee Exotic Plants Council 1996, in Batcher, 2000) and as high as 77% (Schopmeyer 1974, in Batcher, 2000). The pure variegated form is not known to produce viable seeds (H. Gramling, Tampa Bay Wholesale Growers 1998 personal communication, in FLEPPC, Undated). The species is capable of producing more than 2,000 propagules annually as 2,800 fruit per stem has been reported as an average annual production (Westoby, Dalby & Adams-Acton 1983 in DPI, 2009). PIER (2003) states that this species is commonly bought as an ornamental and used for hedges. It has been identified as an important forage plant for deer in the southeastern U.S. (Stromayer et al. 1998, in Batcher, 2000). 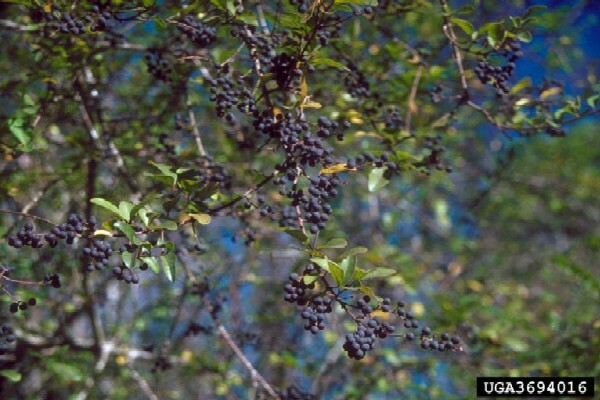 Ligustrum sinense commonly forms dense thickets in fields or in the understory of forests (Invasive.org, 2010). It grows in a variety of forests, shrublands, woodlands, flood plains, wetlands, and coastal areas, but also has a particular affinity for disturbed or urbanized locations like cleared fields or along roadsides (Batcher, 2000; Greene & Blossey, 2009; Williams & Minogue, 2008; PIER, 2010). Occurrences have been recorded from lowland areas and up to 1830 meters elevation (Williams & Minogue, 2008; PIER, 2010). 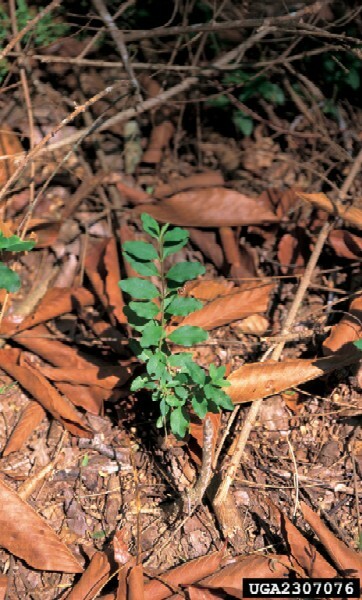 L. sinese tolerates a wide range of soil conditions and is shade tolerant, and tolerates, or even benefits from mutilation, cultivation, or fire (PIER, 2005). Ligustrum spp. have been cultivated and developed into several horticultural varieties, which were introduced to North America and New Zealand as a common hedge in landscaping (Batcher, 2000). 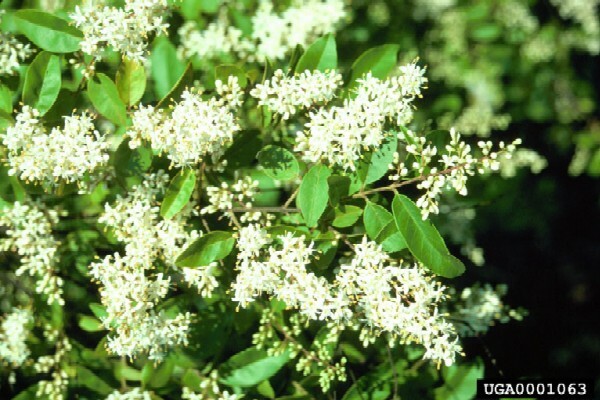 Recommended citation: Global Invasive Species Database (2019) Species profile: Ligustrum sinense. Downloaded from http://www.iucngisd.org/gisd/species.php?sc=241 on 22-04-2019. Ligustrum sinense is extremely invasive and forms dense monospecific layers in forest interiors and edges that outcompete, displace and shade out native vegetation (Batcher, 2000; DPI, 2009; Invasive.org, 2010; Morris et al, 2002; Zhang, 2009). It reduces native plant abundance and diversity (Green & Blosey, 2009; Wilcox &Beck, 2007). These reductions in species richness and overstory reproduction associated with L. sinense could impact long-term forest structure and ecosystem function (Loewenstein & Loewenstein, 2005). It has been found to have toxic effects on animals and macroinvertebrates (DPI, 2009b; PIER, 2005), and one study observed that beetle richness increased greatly after its removal (Ulyshen et al, 2009). It is also believed to have a negative impact on water quality (DPI, 2009b). Restoration potential is likely to be lowest where Ligustrum spp. occur in high densities and there is a high likelihood of continued dispersal of seeds into the restoration area. If attacked during the early stages of colonization, the potential for successful management is high. Manual and mechanical, environmental/cultural, and chemical methods are all useful in varying degrees in controlling Ligustrum spp. For details on preventative measures, chemical, physical, biological control options, please see management information. Informations on Ligustrum sinense has been recorded for the following locations. Click on the name for additional informations. Baker, W. UNDATED. Plant Pest Control: Privet: Ligustrum lucidum, Ligustrum sinense. Bay of Plenty Regional Council, New Zealand. Summary: Detailed report on introduction, origin, description and control. Available from: http://envbop.govt.nz/publications/PDF/FactSheets/PP1098.pdf [Accessed 29 May 2003]. Batcher M.S. 2000. Element Stewardship Abstract for Ligustrum spp. The Nature Conservancy. Available from: http://www.invasive.org/weedcd/pdfs/tncweeds/ligu_sp.pdf [Accessed 19 July 2010]. PIER (Pacific Island Ecosystems at Risk), 2003. Ligustrum spp. Virginia Native Plant Society / Virginia Department of Conservation and Recreation (VNPS/VDCR) Undated Invasive Alien Plant Species of Virginia: Chinese Privet (Ligustrum sinense) Virginia. Summary: Summary on description, habitat, threats and control. Available from: http://www.vnps.org/invasive/FSLIGUS.html [Accessed 29 May 2003]. Summary: Reference suggested by the reviewer for information on impacts. Morris, L.L., J.L. Walck, and S.N. Hidayati. 2002. Growth and reproduction of the invasive Ligustrum sinense and native Forestiera ligustrina (Oleaceae): implications for the invasion and persistence of a nonnative shrub. International Journal of Plant Sciences 163: 1001-1010.